Happy Sunday everyone! Today I thought I'd share this unusual piece with you. It was something I did during my GCSE years at school, when we were trying new techniques. I actually really enjoyed working with the hot wax on silk, though it is not a process I have tried again since then! Batik is an ancient Indonesian technique of wax-resist dying/painting on fabric. After the wax is applied to the material, the colours won't be able to run into those areas, meaning that very definite patterns can be created. 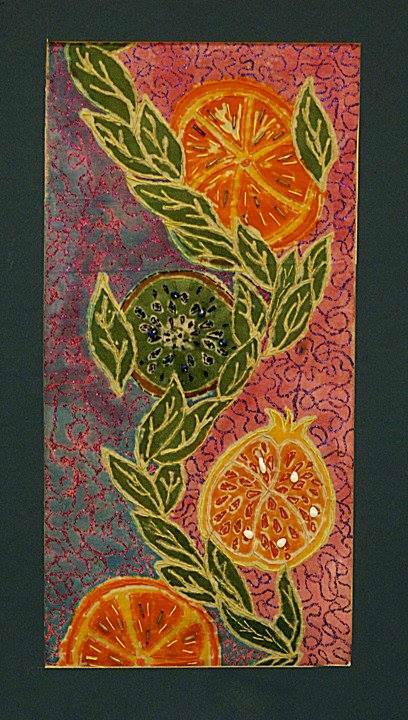 Here I used the wax to draw the fruit and leaves, free-hand, as well as the "squiggles" in the background. 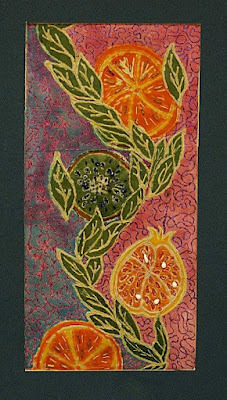 The silk was painted with dyes, then I embroidered the fruit and leaves with thread and beads to add more dimension to the piece. I wasn't satisfied with the pale squiggles in the background, so traced over the wax again with glitter glue! At the time, I was focused on watercolour painting and pencil sketching, so this piece definitely gave me a chance to showcase different techniques and mediums.